Members of the Italian Red Cross were honoured for their work in helping desperate migrants who arrived on Italian shores after crossing the Mediterranean Sea. In the shadow of mounting challenges, the Movement’s 32nd International Conference made a case for building a stronger humanitarian response from the ground up. The conflict in Syria, now in its sixth year, with worsening levels of violence, suffering and disregard for the rules of war. Enduring conflicts in Afghanistan, Iraq, Somalia and Yemen, along with instability and violence in numerous other regions. An El Niño weather phenomenon causing drought in some areas and storms in others. Mass migration towards Europe of people fleeing wars in Afghanistan, Iraq and Syria, as well as political instability and poverty elsewhere, resulting in ever-more deaths at sea and misery along the migration trails. Ongoing humanitarian crises related to migration in Africa, Asia–Pacific and the Americas. A chronic lack of systemic healthcare in many parts of the world, leading to serious global health emergencies, such as the deadly Ebola virus disease epidemic in West Africa. Continuing attacks on aid workers and health facilities. More than 169 governments and National Red Cross and Red Crescent Societies from 185 countries, as well as the IFRC and the ICRC, took part in the three-day meeting, which centred on building consensus and crafting agreements aimed at better preparing for and responding to natural disasters, conflict, violence, health emergencies and chronic social problems. In all, states and Movement components adopted ten resolutions on a wide range of issues: increasing action on the prevention of and response to sexual and gender-based violence; strengthening international humanitarian law; protecting persons deprived of their liberty; protecting humanitarian volunteers and the provision of healthcare; and strengthening legal frameworks for disaster response, risk reduction and first aid. The conference also authorized the ICRC and the Swiss government to continue consultations with states towards developing mechanisms for improving compliance with international humanitarian law. But it stopped short of adopting a proposal by the ICRC and the Swiss government for a voluntary system aimed at improving practices on the ground through self-reporting among states. The gathering was also a chance to raise awareness and build momentum for putting these resolutions, and other humanitarian initiatives, into action on the ground. At a time when humanitarian access during conflict is increasingly difficult, one of the key messages to all parties was an urgent call to let humanitarians get on with their work — to ensure they have safe ways of reaching people affected by conflict or other calamities. It was also a chance to rally support around helping local communities themselves to become more resilient via concrete investment in disaster preparedness, health systems and small-scale economic initiatives. In both cases, the locally based networks of volunteers of Red Cross and Red Crescent National Societies, were a central part of the message. 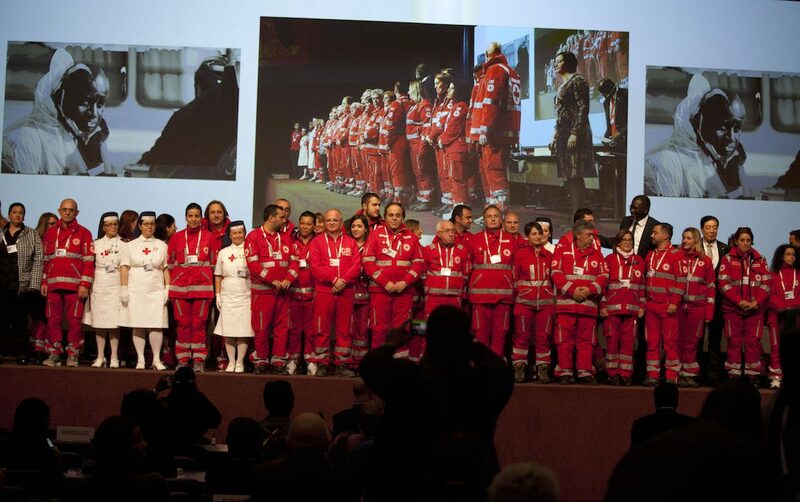 The Syrian Arab Red Crescent and its volunteers, for example, were honoured for their efforts in providing the bulk of international support, to people trapped by fighting, while Italian Red Cross volunteers were honoured for providing food, medical treatment, shelter and other services to newly arriving migrants. Volunteers from West African National Societies were also able to share the story of their role in stopping the spread of the Ebola virus disease. As the number of Ebola cases dwindled in western Africa in 2015, the Movement’s response showed how local volunteer networks were able to break through community fear and distrust, engage in incredibly sensitive work and, ultimately, fight back the deadly outbreak successfully. Mariama Manneh, a 24-year-old volunteer with one of the Sierra Leone Red Cross Society’s Safe and Dignified Burials teams, is one example. Until she joined her local team, only male volunteers were collecting the bodies — something that went against the traditional belief that only women should prepare female bodies for burial. At the same time, the conference was also energized by other global meetings such as the COP21 climate talks in Paris, where pressure from thousands of environmental, development and humanitarian groups (including the Movement) led world leaders to hammer out a climate accord that set specific targets for stabilizing global temperatures, reducing emissions and investing in mitigating the consequences of climate change. In Geneva, meanwhile, the IFRC launched the One Billion Coalition for Resilience, aimed at creating worldwide, locally based momentum for risk reduction and other measures to make disaster-prone communities less vulnerable to shocks. Another international meeting, set for Istanbul, Turkey in May 2016, was also on the agenda. Organized by the United Nations, the World Humanitarian Summit will bring together international aid agencies, non-governmental organizations and local humanitarian groups to discuss how to improve the effectiveness of humanitarian assistance. Based on comments gathered from community leaders, volunteers and front-line aid workers during five ‘hub’ events in each key region, as well as the Voices to Action campaign (see below), the Movement also crafted and approved a statement to the World Humanitarian Summit that called for “clear commitments on respect for human dignity and people’s assistance and protection in disaster, armed conflict and other emergencies”. The statement also called on the summit to place more priority on funding locally based humanitarian action. “The international system still places an overwhelming emphasis on international actors, leaving local organizations insufficient influence over operational decision-making and humanitarian policy. While many humanitarian organizations (including the ICRC) are operating with record budgets, due to the enormity of needs, the continuous and growing scale of humanitarian needs globally has led to calls for change in the way humanitarian and development aid is delivered. Some critics of the humanitarian sector argue that the aid system is broken and needs a complete overhaul, while others suggest it is simply underfunded and that the basic structure of the international aid system is essentially effective. Consultations leading up to the summit have brought several key themes to the fore, most notably, strengthening the capacity of national governments and local communities to respond to challenges rather than continually placing the lion’s share of resources in the hands of international humanitarian organizations. Still, the statement concludes, support for local action does not need to come at the expense of international humanitarian aid. Rather, the Movement’s statement calls on the summit to “affirm the complementarity of local, national and international action”. 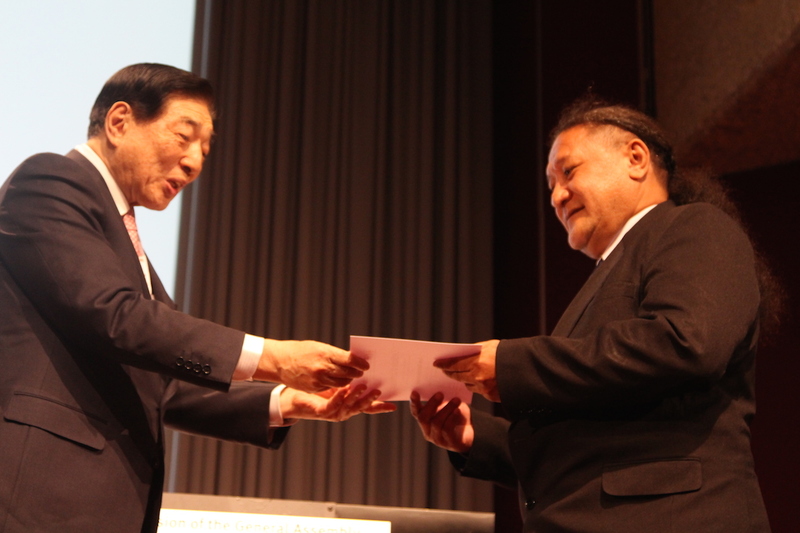 The 20th General Assembly of the IFRC admitted the Tuvalu Red Cross Society into the International Federation, making it the 190th National Society to join the Movement. Given the worries many in Tuvalu have due to rising sea levels around this island nation, this is very “good news”, said Isaia Vaipuna Taape, an executive board member of the Tuvalu Red Cross. “This is a special day for us,” he said, adding that the National Society’s new status will enhance its relations with local and international partners and help it represent pressing humanitarian concerns, such as climate change, at the international level. Sadly, the secretary general of the Tuvalu Red Cross, Olioliga ‘Oli’ Iosua, was unable to attend the assembly due to an illness that ultimately resulted in her passing away in late January. Widely recognized as an inspirational and visionary leader, Iosua stood out as an important humanitarian voice in the Pacific. The Movement meetings were also a chance to hear from opinion leaders who challenge some of the assumptions that have guided development and humanitarian aid. 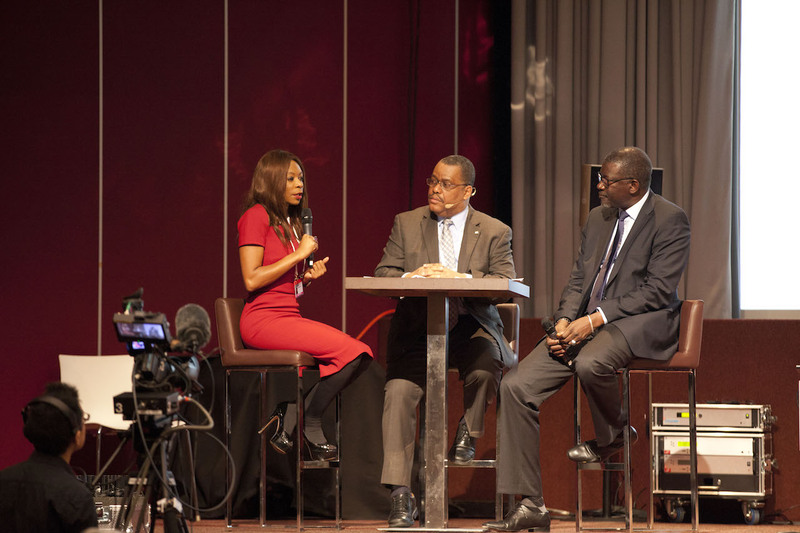 One of them was economist Dambisa Moyo, the author of Dead Aid, why aid is not working, who has long argued that large-scale development aid can do more harm than good. Speaking to the gathering, she made it clear she was not arguing against emergency aid. “There is a moral imperative for us to act,” Moyo said. “If we are a part of a global human family we cannot stand by the sidelines when there is an atrocity occurring.” Her main concern is long-term, large-scale development aid. One key problem, she added, is that major aid packages create dependencies among recipient governments while breaking important social contracts by making aid-dependent governments more accountable to international donors than to citizens and taxpayers. A Movement initiative called Voices to Action aimed at bringing the perspectives and ideas of local humanitarians from communities around the world to both the International Conference, and the World Humanitarian Summit in Istanbul, Turkey in May 2016. Here are just two of the comments from the roughly 7,000 people who contributed via social media, hub events and face-to-face interviews. “Advocate for greater collaboration between healthcare services, particularly between developed and developing countries, which could make a real difference in ensuring a timely response during natural disasters [and] disease outbreaks,” said one participant from Rwanda. “Each house or family should have one person who has been trained in emergency care so that he or she can perform first aid before the medical professionals arrive,” said another from Indonesia. Still more ideas and perspectives were added at the ‘Vision Lab’, a brainstorming space set up in one of the meeting rooms.